Lawyers for a Dallas police officer filed a federal civil suit late Tuesday against Twitter, Facebook and Google for allegedly providing “material support” to the Palestinian militant group Hamas and purportedly helping radicalize Micah Johnson, the Army veteran who killed five police officers and wounded nine others in an ambush last July. 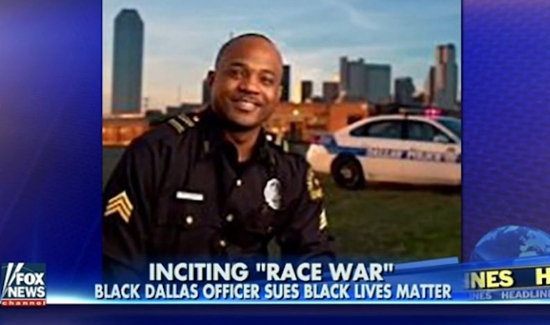 Johnson, a 25-year-old Army Reserve Afghan War veteran and Black Nationalist, carried out an “ambush-style” attack on Dallas law enforcement during a protest in Texas over the recent police-related killings of two African-American men. Johnson was eventually killed by a robot-delivered bomb. While he has not been linked to any foreign terror organization, Johnson did visit and like numerous websites dedicated to the Black Lives Matter movement, the Nation of Islam and the New Black Panther Party – all of whom have sympathized with the Palestinian cause. “The New Black Panther Party and other black separatist groups are directly linking themselves to Palestian groups and they are sharing this stuff on Facebook,” Pennie, who is also the president of the Dallas Fallen Officer Foundation and a 17-year law enforcement veteran, told FoxNews.com. Pennie added that any money he is awarded from the lawsuit – or a similar one he has filed against Black Lives Matter – would go directly to his foundation. The question of whether or not Hamas’ social media feeds had any influence on Johnson – either directly or indirectly – is something that the federal court will have to decide, but what is not in question is the frequency that companies like Twitter, Facebook and Google have been hit with lawsuits from survivors or families of the victims of domestic and international terror attacks. “There seems to be a spate of these cases recently and it’s probably because there have been recently a spate of these tragedies,” Matt Bartholomew, a professor at the University of Buffalo School of Law, told FoxNews.com. Hamas, along with terror groups like the Islamic State and Al Qaeda, maintain an active presence on both Facebook and Twitter as a way to recruit and radicalize followers and also rely heavily on the Google-owned YouTube to post propaganda, press releases and even executions. Ed. Note: Facebook CEO and billionaire Mark Zuckerberg recently had a closed-door meeting with the Dallas PD, and sources say that Zuckerberg is testing the waters for a 2020 Presidential run because… why not?